First published in The Model, magazine of the British Board of NLP edition 2, 2005. David Grove pioneered the ground breaking technique of Clean Language while working with trauma victims during the 1980s. He discovered that patients would often speak in metaphor when describing their pain and that the most effective way of alleviating the effects was to honour their metaphors by asking open questions which reflected the patient's exact words. Over a period of years, David identified 9 questions that would least influence the patient in their metaphorical journey, and he gave this process the name, "Clean Language". The technique was observed by therapists Penny Tompkins and James Lawley, who devoted the next 3 years to modelling David's techniques into a methodology that could be taught to and practised by others (see www.cleanlanguage.co.uk). David has since developed his work through Clean Space (moving clients on by literally moving them around in space) and Clean Worlds (which explores the boundaries between spaces). His newest concepts revolve around the science of emergent knowledge. It is accepted wisdom that achievement requires effort, will and determination and that conventional coaching, using models such as GROW, will provide the motivation for all these qualities. However, where Clean Coaching differs is that it integrates innate obstacles, such as fear, anger or limiting behaviour patterns, into energies which will participate with instead of working against the client. The emergent knowledge principles incorporated into Clean Coaching treat the client's psyche as a system. In these uncertain times, our work and personal lives are subject to a baffling array of changes and options. One of the most common reasons for clients to take on a coach is not to reach a specific goal, but to work out which specific goal they should commit to. Many people have the feeling that there is a congruence missing in their lives, a pathway they are meant to be on if only they could find it. During our lives, particularly in the early years, we may be turned away from the paths with which we might feel a sense of congruence by external circumstances, such as parental control, death, schooling or illness. These experiences can change the systems of our internal landscape, or psychescape, creating barriers where old knowledge can no longer be accessed. Through the Clean Coaching exercises, the systems of the 'psychescape' are explored spatially. The coach asks a series of questions approximately 6 times, without regard to the content of the client's answers. During this process, knowledge will emerge which will unravel systems which have become convoluted, uncovering knowledge which had previously been obscured. The internal changes achieved automatically re-align what the client is able to know, think, feel or achieve in the external world. No effort is required: it is like a train running on different tracks. Goals to which the client may have been obsessively driven prior to the clean coaching experience may seem irrelevant after it or easily achievable. The physiology of effort does not come into play. Clean coaches do not motivate, encourage or challenge their clients; they move their clients forward by facilitating a re-arrangement of their psychescape through emergent knowledge solutions. The emergent knowledge process of asking repetitive questions, as used in Clean Coaching, is based on the principles of the new science of emergence, which explores the processes that enable ants to create their city-like nests, cities to create themselves, and internet sites such as Amazon and Google to function through iterative algorithms. For more information on the science of emergence, read Steven Johnson's book 'Emergence', or try Michael Crichton's thriller 'Prey' for the entertaining version. In emergent knowledge, the client's psyche is treated as a system and a change in one part of the system will affect other parts of that system. If the client's issue can be thought of metaphorically as an egg type problem, then conventional knowledge processes look for an egg type solution. The application of the emergent knowledge system creates a non-ordered, non-linear small world network of seemingly unrelated, irrelevant, red herring type data points that coalesce at what might be termed a 'sweet spot', in which the mantle of a non-scaling, profound knowledge experience changes the very core of the client. In this moment emerges a new world order solution, one which confers the wisdom of a chicken's cosmology rather than that of the egg. Hence, emergence creates opportunities to solve egg type problems with chicken type solutions. 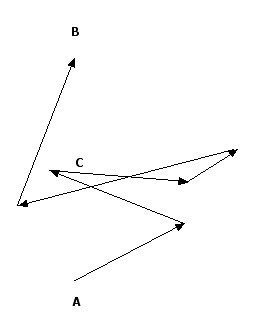 Position B is the object. What is your goal/mission statement/purpose in life/desired outcome? Can you write or draw that goal on a piece of paper or find an object that represents it and place it in a space that feels right to you. Where would you be in relation to your goal? In front, beside, behind, in another room? Is the distance right between you and the goal? Is the goal in the right space? Are you at the right height? Is the goal at the right height? Is the goal facing the right direction? Are you the right amount of distance from the goal? And what do you know now, from that space there? Through asking the iterative questions, new knowledge will have emerged about the goal. The coach then continues to emerge knowledge by choosing questions from a selection of Clean Coaching exercises. If someone had already achieved their goal, it would not be across the room at B: it would be right there next to them. There is a certain separation or distance between them and their goal in their particular model of the world and it is this difference that is the driver which compels them to engage the facilitator in a service to help them move from A, their current reality, to B, their desired outcome. This journey is represented by C. Now, if the client could do the journey of C, they would have done it already. So the space of C contains the blockages which have hindered their progress so far and will also contain some elements which will help them on their journey and which the coach or facilitator will help them uncover. The theory of the 'six degrees of separation' arises from studies which show that, mathematically, among the billions of people throughout the world, there is a probability of any one person being connected to any other by no more than 6 links. Similarly, with emergent knowledge, it should take a client on average six spatial moves to find the link that leads to a solution. The key to the linkages are the weak ties between the logical steps that one would normally take to find an answer and these weak ties act like short cuts to the solution. For example, if there are 50 points on a circle, you would imagine you have to go through each point to complete the circuit, but if there are a number of weak links across the circle where one vaguely knows another, then all of a sudden you can jump to a place where only two more points are required to reach the end instead of 40. The weak links that create this type of network in a client's inner psychescape might arise from some offhand or obscure remark which, if picked up on, can take a client to the sweet spot of a new perspective and a solution which might not appear if the most obvious line of enquiry were followed. The key is for the facilitator to use simple iterations (repetitive questions) over and over again in order to guide the process until a network solution occurs. There is other domains which exists outside of the framework that the client is referring to in terms of how they define where they are and what their goal is. 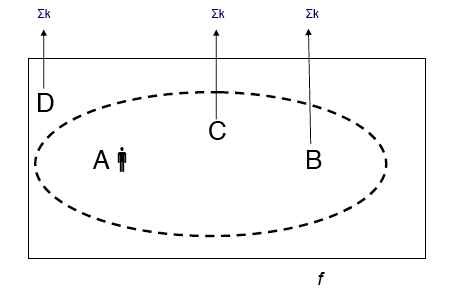 We call this the space of D. In this D space lies information and knowledge which is outside of the boundary of the world that they have defined in terms of wanting to get from A to B. There may also be blocks that lie with the client at A, and those are quite different criteria from the things that are in front, at C and B, and the hindrances in the space of A will need to be coached differently and are sourced in different places from the problem domains of C and B. So now you have 4 different problem domains at A, B, C and D which each need to be coached in separate and different ways because the sources that created them are in fact quite independent of each other. If we think then of this as being a system or a model of the client's inner world that the client is going to bring to you, the coach or facilitator, then there is a boundary between each domain and it is this world view which you will be coaching. This inner world has very little relationship to the real world and real life circumstances of the client. So there is an inherent problem coaching the client in that real world space at A, and a degree of difficulty in trying to reach the goal directly from A to B, because the closer you try to get them there, the more the inner complexity of their various problem domains will get in the way. Emergence creates boundary conditions by laying the problem out in space and engages the individual's intuition as the primary guide to finding a solution. The facilitator stands outside of this process and does not add, comment, discuss or analyse any of the client's content. The facilitator is engaged at the operating systems level, asking a series of questions several times over, independent of the content offered by the replies of the client. Emergent knowledge holds that the expression that is inherent in the nature of the problem also contains everything that is necessary for its solution. Conventional knowledge moves you from A to B and is goal oriented: emergent knowledge changes both the nature of the person at A and the nature at the problem or goal at B, such that, to a new world order, getting from A to B is irrelevant. An emergent solution is one that is evidenced by a natural state of being in which mind, body, soul and spirit are of one accord, allowing the unexpressed shadow side of knowledge to have equal congress with the socially acceptable expression of the problem. When completed, an emergent knowledge solution has a natural and congruent fit for the client and does not require the physiology of effort, such as practice, reinforcement or dint of will to maintain the solution. Carol Wilson is Honorary Vice President of the Association for Coaching (AfC) and experienced the value of a coaching culture at first hand while working at board level for Richard Branson during the early years of Virgin. Since becoming a coach 5 years ago, Carol has trained or supervised the training of over 400 coaches in the public, corporate and private sectors, is a keynote speaker, broadcaster and writer, has written a guide to coaching called The Coaches' Handbook and was nominated for the AfC Influence in Coaching Award 2004. Carol has incorporated David Grove's methods into her coaching work since 2002, and was invited last year to partner David in defining his techniques into a Clean Coaching methodology, see the articles written with David Grove. For further information visit: www.carolwilson.co.uk, www.cultureatwork.net and www.cleancoaching.com.